Forum Index > Historical Arms Talk > Barbed Spearhead? or not??? Posted: Thu 01 Dec, 2016 8:25 am Post subject: Barbed Spearhead? or not??? 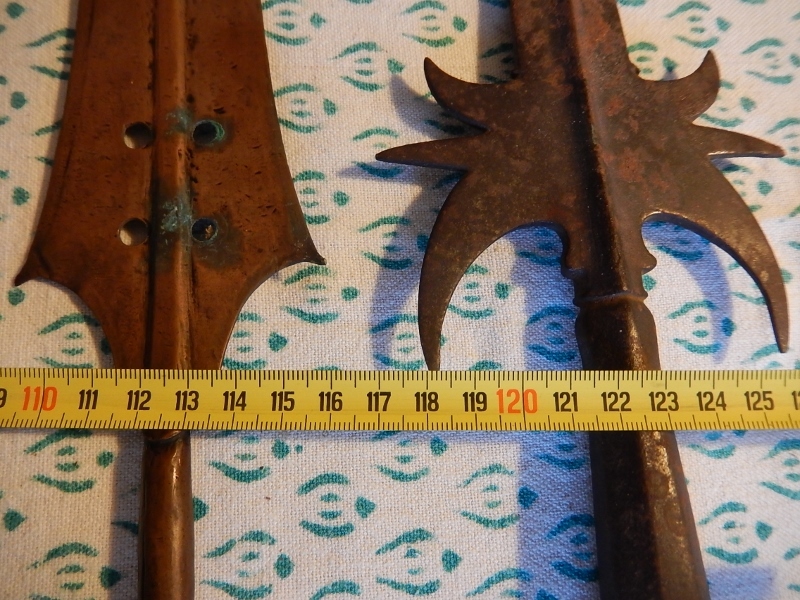 Hi All - I'm hoping that someone might steer me in the right direction on these spearheads - assuming that is what they are. I'm a bit of a novice with armoury - and yesterday I was given these. The elderly lady told me they came to her from her great grandparents - and were, she believed, from Africa. Can anyone confirm this to be the case - and if they are from Africa - which part? The one with the four holes looks to be made from copper - is this what is termed a currency spearhead? It measures approx 32cm and is aprox 7cm at its widest part. The other is very heavy - I'm assuming iron - measures 31cm to the place where there is evidence of a wooden handle(there is an additional 7cm of leftover wood and iron). I - cannot seem to find anything similar to the heavy piece - so wondering whether it isn't a spearhead?? I also don't seem to find anything like the copper one - in copper. [img][/img]Any information on either of these pieces would be really gratefully received. I'm keenly interested in anything old and there is nothing I like more than to learn about things outsice my normal spectrum. Thanking you all in advance for any help or advice you might be able to give. Very interesting! The iron head is for a European polearm generically called a partizan or spontoon. This example appears to be late--possibly even as late as 18th or 19th c., but possibly as early as the 17th c. In that era, these were weapons for officers and guards--badges of rank more than weapons, but still built to serve in combat. I can certainly imagine those being in colonial armouries. The other strikes me as being more ceremonial, given the soft, bright metal. It might be native, modeled on European types and serving the same purpose as the more robust example. It should be pretty simple to date the iron head with some hunting online. See the attached image for some idea about how this weapon developed (top right). Thank you so much for your informative reply - really interesting - and now I know what the correct term is - I'm now seeing similar images. Can you give me any guides on how to date these? Is there anything in particular I need to look at - or is this one of those things you learn after years of handling? Are these common items - not my usual thing at all - and a bit gutted that the ax I had has been passed on - didn't realise what I had!!!! Many thanks once again for your time and effort. Worthy of note are the two broken iron straps below the socket of the iron spontoon head. Those are called langets, and their purpose is to reinforce the haft of the weapon, helping to prevent damage in combat use. Their presence tends to suggest that this is an authentic military antique as opposed to something made as a theatrical prop. If I had to bet, I would bet that the iron spontoon is French, 18th c., and not associated with Africa. The copper example has a uniquely European look to it--especially the shape of the blade--but I don't recall seeing anything quite like it. That sounds like a reasonable early date for yours. 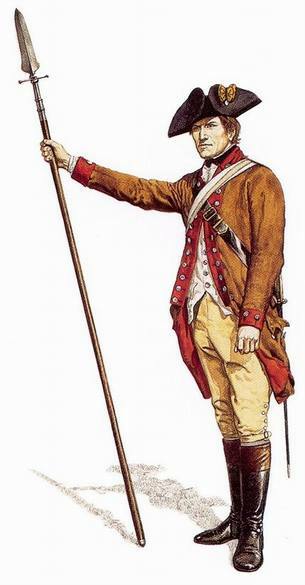 The last military spontoons (esponton) often had a cross bar at the base of the head, so the design of yours makes me think it's pre-Napoleonic. Here's a helpful depiction of what these looked like in French use. By the way, the theory of giving officers spontoons is that they should be armed with something more than a sword, but can't be distracted by the process of loading a musket. They have to keep their eyes on the course of the battle and give orders accordingly. Posted: Thu 01 Dec, 2016 12:23 pm Post subject: Re: Barbed Spearhead? or not??? The elderly lady told me they came to her from her great grandparents - and were, she believed, from Africa. Can anyone confirm this to be the case - and if they are from Africa - which part? The one with the four holes looks to be made from copper - is this what is termed a currency spearhead? [...] I also don't seem to find anything like the copper one - in copper. The copper one is definitely African, definitely Congo, probably Nkutshu or Tetela. It's made in the same style as iron spears, and is possibly a high-status fighting weapon. High status, for sure. But functional, rather than a currency spearhead. Hey guys - thank you all very much for the replies - enjoying learning about all this. I currently live in France - as does the lady who gave these to me - however she has Belgium descent - wondering if that has any relevance to origin of the spontoon? As a result of all your replies, I have a couple of further questions if you can spare me the time. When you say "these weapons are not especially valuable and were made in great numbers" - are you refering to the reproductions or the genuine article? Also - Timo mentioned that the copper spearhead isn't currency - out of curiousity - why is this the case? Just for my learning curve. On the spontoon head - what exactly should I be looking for to ascertain the date - Obviously I don't have the pole - just remnants still attached and a couple of fixings(nails). Is it the length of the fixing that attaches to the shaft that would indicate the age? Or perhaps types of fixings? Apologies if these are stupid questions - or my terminology is incorrect. I'm assuming that it would be wise to not clean either of these and to leave to a future owner (that is generally how I feel about most antiques - I personally like things to retain the age/patina - and knowing nothing about these I'm guessing this would be wise???) Thank you all once again for you time and effort. AFAIK, currency spears/knives were often not functional as weapons (e.g., my middle "knife" in the link, which has a solid "socket", so I thought this might be a candidate for currency). Typically not sharp - sharp would make them harder to carry, and sharp edges get damaged more easily. Also, metal is removed when grinding a sharp edge. Often designed for spectacular appearance (e.g., currency spearheads well over 1m long). Your head looks like a normal functional spearhead. If it has thick never-sharpened edges then it isn't functional, but I'd think it a ceremonial/display spearhead before currency. This painting of the battle of Fontenoy shows officers using spontoons in combat. Thank you both for your replies. This has been a most enjoyable learning curve for me - and hopefully all knowledge gained will come in useful not just now - but in the future. Ever hopeful that this lady may have more items of a similar ilk - still kicking myself over the axe ...... What a fascinating subject - have loved researching these - now to get on with the task of selling them. Not expecting anyone to proffer me valuations (although would be grateful ... ) However - as I cannot find anything like the copper congo spear head - can anyone indicate whether this would be more or less valuable than a similar non-copper one. I'm also at a loss to the date of this item. Also - when selling these types of item - is there anything that is quite specific to mention that affects value - positively or negatively - I'm always very keen to give very honest descriptions of anything I sell - pointing out any defect etc up front. To me it saves a whole lot of hassle - and results in happy customers. Hoping you all have a good weekend. However - as I cannot find anything like the copper congo spear head - can anyone indicate whether this would be more or less valuable than a similar non-copper one. I'm also at a loss to the date of this item. In the Congo, it was more valuable than a similar iron head (that's why it's a high-status item). Now, and in the West, I'd say it's more valuable, since it's less common. 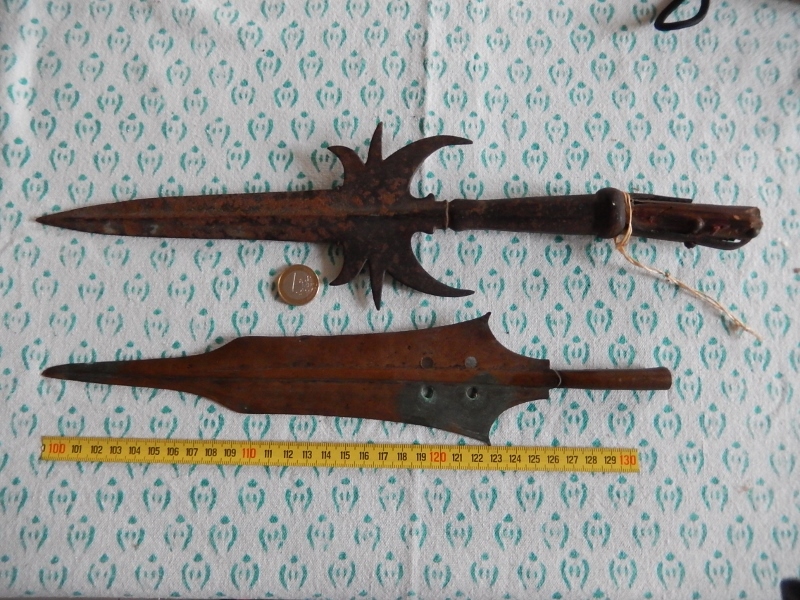 But Congo spearheads tend to be cheap; the last two (iron ones) I bought were under US$50 and US$30. My guess is that this copper one is c. 1900. Early 20th century at the latest. Sounds like the copper head could be a souvenir of somebody's service in the Belgian Congo. As for dating--what I'm seeing on this type (including that 1688 French wreck) suggests late 17th or early 18th c.
The cross-bar type (see below) seems to be common by mid-18th c., but I don't know if that's true for all of Europe. It seems reasonable to date yours 1650-1750, with the sweet spot in the last quarter of the 17th c.
Hermann Historica often has things like this. Well a massive thank you to you all - with all the information you have given to me I've now done lots of research and listed them for sale on ebay, I decided to put a $240 start on the polearm and $60 on the spearhead. As I'm not really sure where they may end up price wise, I thought an auction listing the best way for me to go - it's a shame that that doesn't appear to be an option on here - otherwise I'd have listed them on this site. I will report back at the end of the sales to let you lovely people know how they fared. Wishing you all the very best - and hopefully I will be back on here very soon - as I've suddenly discovered a new very interesting area of collecting. A true inspiration. We're always happy to guess! Good luck with that set and please do let us know how things turn out. It might be that a prospective buyer has more information or can ask better questions to get deeper into those stories. Here's a little more information for you, Beth.